The Schutzstaffel (SS; also stylized as with Armanen runes; German pronunciation: [ˈʃʊtsˌʃtafəl] ( listen); literally "Protection Squadron") was a major paramilitaryorganization under Adolf Hitler and the National Socialist German Workers' Party (NSDAP; Nazi Party) in Nazi Germany. It began with a small guard unit known as theSaal-Schutz (Hall-Protection) made up of NSDAP volunteers to provide security for party meetings in Munich. In 1925, Heinrich Himmler joined the unit, which had by then been reformed and given its final name. Under his direction (1929–45), it grew from a small paramilitary formation to one of the most powerful organizations in Nazi Germany. From 1929 until the regime's collapse in 1945, the SS was the foremost agency of security, surveillance, and terror within Germany and German-occupied Europe. The two main constituent groups were the Allgemeine SS(General SS) and Waffen-SS (Armed SS). TheAllgemeine SS was responsible for enforcing the racial policy of Nazi Germany and general policing, whereas the Waffen-SS consisted of combat units of troops within Nazi Germany's military. A third component of the SS, the SS-Totenkopfverbände (SS-TV), ran the concentration campsand extermination camps. Additional subdivisions of the SS included the Gestapo and the Sicherheitsdienst (SD) organizations. They were tasked with the detection of actual or potential enemies of the Nazi state, the neutralization of any opposition, policing the German people for their commitment to Nazi ideology, and providing domestic and foreign intelligence. The SS was the organization most responsible for the genocidal killing of an estimated 5.5 to 6 million Jews and millions of other victims in the Holocaust. Members of all of its branches committed war crimes and crimes against humanity during World War II (1939–45). The SS was also involved in commercial enterprises and exploited concentration camp inmates as slave labor. After Nazi Germany's defeat, the SS and the NSDAP were judged by the International Military Tribunal at Nuremberg to be criminal organizations. Ernst Kaltenbrunner, the highest-ranking surviving SS officer at the time, was found guilty of crimes against humanity at the Nuremberg trials and hanged in 1946. By 1923, the Nazi Party (NSDAP) led by Adolf Hitler had created a small volunteer guard unit known as the Saal-Schutz (Hall-Protection) to provide security at their meetings in Munich. The same year, Hitler ordered the formation of a small bodyguard unit dedicated to his personal service. He wished it to be separate from the "suspect mass" of the party, including the paramilitary Sturmabteilung ("Storm Battalion"; SA), which he did not trust. The new formation was designated the Stabswache (Staff Guard). Originally the unit was composed of eight men, commanded by Julius Schreck and Joseph Berchtold, and was modeled after the Erhardt Naval Brigade, a Freikorps of the time. The unit was renamed Stoßtrupp (Shock Troops) in May 1923. The Stoßtrupp was abolished after the failed 1923 Beer Hall Putsch, an attempt by the NSDAP to seize power in Munich. In 1925, Hitler ordered Schreck to organize a new bodyguard unit, theSchutzkommando (Protection Command). It was tasked with providing personal protection for Hitler at NSDAP functions and events. That same year, the Schutzkommando was expanded to a national organization and renamed successively the Sturmstaffel (Storm Squadron), and finally the Schutzstaffel (Protection Squad; SS).Officially, the SS marked its foundation on 9 November 1925 (the second anniversary of the Beer Hall Putsch). The new SS was to provide protection for NSDAP leaders throughout Germany. Hitler's personal SS protection unit was later enlarged to include combat units. Between 1925 and 1929, the SS was considered to be a small Gruppe (battalion) of the SA. Except in the Munich area, the SS was unable to maintain any momentum in its membership numbers, which declined from 1,000 to 280 as the SA continued its rapid growth. As Heiden attempted to keep the SS from dissolving, Heinrich Himmler became his deputy in September 1927. Himmler displayed good organizational abilities compared to Heiden. The SS established a number of Gaus (regions or provinces). The SS-Gaus consisted of SS-Gau Berlin, SS-Gau Berlin Brandenburg, SS-Gau Franken,SS-Gau Niederbayern, SS-Gau Rheinland-Süd, and SS-Gau Sachsen. With Hitler's approval, Himmler assumed the position of Reichsführer-SS in January 1929. There are differing accounts of the reason for Heiden's dismissal from his position as head of the SS. The party announced that it was for "family reasons." Under Himmler, the SS expanded and gained a larger foothold. He considered the SS an elite, ideologically driven National Socialist organization, a "conflation ofTeutonic knights, the Jesuits, and Japanese Samurai". His ultimate aim was to turn the SS into the most powerful organization in Germany and most influential branch of the party. He expanded the SS to 3,000 members in his first year as its leader. In 1929, the SS-Hauptamt (main SS office) was expanded and reorganized into five main offices dealing with general administration, personnel, finance, security, and race matters. At the same time, the SS-Gaus were expanded into three SS-Oberführerbereiche areas, namely the SS-Oberführerbereich Ost,SS-Oberführerbereich West, and SS-Oberführerbereich Süd. The lower levels of the SS remained largely unchanged. Although officially still considered a sub-organization of the SA and answerable to theStabschef (SA Chief of Staff), it was also during this time that Himmler began to establish the independence of the SS from the SA. The SS grew in size and power due to its exclusive loyalty to Hitler, as opposed to the SA, which was seen as semi-independent and a threat to Hitler's hegemony over the party, mainly because they demanded a "second revolution" beyond the one that brought the NSDAP to power. By the end of 1933, the membership of the SS reached 209,000. Under Himmler's leadership the SS continued to gather greater power as more and more state and party functions were assigned to its jurisdiction. Over time the SS became answerable only to Hitler, a development typical of the organizational structure of the entire Nazi regime, where legal norms were replaced by actions undertaken under the Führerprinzip (leader principle), where Hitler's will was considered to be above the law. In the latter half of 1934, Himmler oversaw the creation of SS-Junkerschule (Junker schools), institutions where SS officer candidates received leadership training, political and ideological indoctrination, and military instruction. The training stressed ruthlessness and toughness as part of the SS value system, which helped foster a sense of superiority among the men and taught them self-confidence. The first schools were established at Bad Tölz and Braunschweig, with additional schools opening at Klagenfurtand Prague during the war. The crypt at Wewelsburgwas repurposed by Himmler as a place to memorialize dead SS members. Artwork commemorating the Holocaust hangs on the walls. Commitment to SS ideology was emphasized throughout the recruitment, membership process, and training. Members of the SS were indoctrinated in the racial policy of Nazi Germany, and were taught that it was necessary to remove from Germany people deemed by that policy as inferior. Esoteric rituals and the awarding of regalia and insignia for milestones in the SS man's career suffused SS members even further with Nazi ideology. Members were expected to renounce their Christian faith, and Christmas was replaced with asolstice celebration. Church weddings were replaced with SSEhewein, a pagan ceremony invented by Himmler. These pseudo-religious rites and ceremonies often took place near SS-dedicated monuments or in special SS-designated places. In 1933, Himmler bought Wewelsburg, a castle in Westphalia. He initially intended it to be used as an SS training centre, but its role came to include hosting SS dinners and neo-pagan rituals. As part of its race-centric functions during World War II, the SS oversaw the isolation and displacement of Jews from the populations of the conquered territories, seizing their assets and deporting them toconcentration camps and ghettos, where they were used as slave labor or immediately killed. Chosen to implement the Final Solution for Jews and other groups deemed inferior or enemies of the state, the SS led the killing, torture, and enslavement of approximately 12 million people. 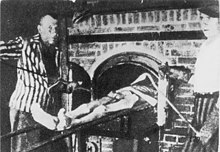 Most victims were Jews or of Polish or other Slavic extraction. A significant number of victims were members of other racial or ethnic groups such as the Romani people. The SS was involved in killing people viewed as threats torace hygiene or NSDAP ideology, including the mentally or physically handicapped, homosexuals, and political dissidents. Members of trade unions and those perceived to be affiliated with groups that opposed the regime (religious, political, social, and otherwise), or those whose views were contradictory to the goals of the NSDAP government, were rounded up in large numbers; these included clergy of all faiths, Jehovah's Witnesses, Freemasons, Communists, and Rotary Club members. According to the judgments rendered at the Nuremberg trials as well as many war crimes investigations and trials conducted since then, the SS was responsible for the majority of Nazi war crimes. In particular, it was the primary organization which carried out the Holocaust. Reinhard Heydrichwas Himmler's protégé and a leading SS figure until his assassination in 1942. 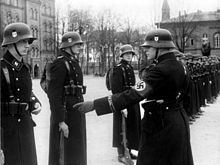 The SS established a police state within Nazi Germany, using the secret state police and security forces under Himmler's control to suppress resistance to Hitler. In his role as Minister President of Prussia, Hermann Göring had in 1933 created a Prussian secret police force, the Geheime Staatspolizei orGestapo, and appointed Rudolf Diels as its head. Concerned that Diels was not ruthless enough to use the Gestapo effectively to counteract the power of the SA, Göring handed over its control to Himmler on 20 April 1934. Also on that date, in a departure from long-standing German practice that law enforcement was a state and local matter, Hitler appointed Himmler chief of all German police outside Prussia. Himmler named his deputy and protégéReinhard Heydrich chief of the Gestapo on 22 April 1934. 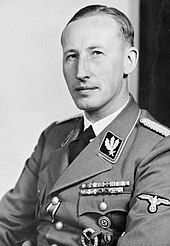 Heydrich also continued as head of the Sicherheitsdienst (SD; security service). The Gestapo's transfer to Himmler was a prelude to the Night of the Long Knives, in which most of the SA leadership were arrested and subsequently executed. The SS and Gestapo carried out most of the killings. On 20 July 1934, Hitler detached the SS from the SA, which was no longer an influential force after the purge. The SS became an independent elite corps of the NSDAP, answerable only to Hitler. Himmler's title of Reichsführer-SS now became his actual rank, equivalent to the rank of field marshal in the army (his previous rank wasObergruppenführer). As Himmler's position and authority grew, so did his de facto rank. On 17 June 1936, all police forces throughout Germany were united under the purview of Himmler and the SS. Himmler and Heydrich thus became two of the most powerful men in the country's administration. Police and intelligence forces brought under their administrative control included the SD, Gestapo, Kriminalpolizei (Kripo; criminal investigative police), and Ordnungspolizei (Orpo; regular uniformed police). In September 1939, the security and police agencies, including theSicherheitspolizei (SiPo; security police) and SD (but not the Orpo), were consolidated into the Reich Main Security Office (RSHA), headed by Heydrich. This further increased the collective authority of the SS. The SS was closely associated with Nazi Germany's concentration camp system. On 26 June 1933, Himmler appointed SS-OberführerTheodor Eicke as commandant of Dachau concentration camp, one of the first Nazi concentration camps. It was created to consolidate the many small camps that had been set up by various police agencies and the NSDAP to house political prisoners. The organizational structure Eicke instituted at Dachau stood as the model for all later concentration camps. After 1934, Eicke was named commander of the SS-Totenkopfverbände (SS-TV), the SS formation responsible for running the concentration camps under the authority of the SS and Himmler.Known as the "Death's Head Units", the SS-TV was first organized as several battalions, each based at one of Germany's major concentration camps. Leadership at the camps was divided into five departments: commander and adjutant, political affairs division, protective custody, administration, and medical personnel. By 1935, Himmler secured Hitler's approval and the finances necessary to establish and operate additional camps. Six concentration camps[a] housing 21,400 inmates (mostly political prisoners) existed at the start of the war in September 1939. By the end of the war, hundreds of camps of varying size and function had been created, holding nearly 715,000 people, most of whom were targeted by the regime because of their race. The concentration camp population rose in tandem with the defeats suffered by the Nazi regime; the worse the catastrophe seemed, the greater the fear of subversion, prompting the SS to intensify their repression and terror. By the outbreak of World War II, the SS had consolidated into its final form, which comprised three main organizations: the Allgemeine SS, SS-Totenkopfverbände, and the Waffen-SS, which was founded in 1934 as the SS-Verfügungstruppe (SS-VT) and renamed in 1940. The Waffen-SS evolved into a second German army alongside the Wehrmacht and operated in tandem with them, especially with theHeer (German Army). Although SS ranks generally had equivalents in the other services, the SS rank system did not copy the terms and ranks used by the Wehrmacht's branches. Instead it used the ranks established by the post-World War I Freikorps and the SA. This was primarily done to emphasize the SS as being independent from the Wehrmacht. In the September 1939 invasion of Poland, the LSSAH and SS-VT fought as separate mobile infantry regiments. The LSSAH became notorious for torching villages without military justification. Members of the LSSAH committed atrocities in numerous towns, including the murder of 50 Polish Jews in Błonie and the massacre of 200 civilians, including children, who were machine gunned in Złoczew. Shootings also took place in Bolesławiec, Torzeniec, Goworowo, Mława, andWłocławek. Some senior members of the Wehrmacht were not convinced the units were fully prepared for combat. Its units took unnecessary risks and had a higher casualty rate than the army. Generaloberst Fedor von Bock was quite critical; following an April 1940 visit of the SS-Totenkopf division, he found their battle training was "insufficient". Hitler thought the criticism was typical of the army's "outmoded conception of chivalry." In its defence, the SS insisted that its armed formations had been hampered by having to fight piecemeal and were improperly equipped by the army.